Physical Real Property files: Examine RP hardcopy files, physical inventory records, and documentation for completeness including DD Forms 1354, floor plans, maps, color photographs (mandatory), Property Cards, cost details, GFEBS screen shots & attestation memos), disposal records (such as DD Forms 1354, DD Forms 337, historic and environmental reviews, DD Forms 1391, Excess or Disposal reports, transfer and privatization documentation), equipment records that exceed capitalization thresholds or change depreciation schedules, and other data (such as inventory inspection reports, diversion/conversion requests to IMCOM, utilization reports, outgrants, contracts & contract mods, work authorizations, statements of work, task and delivery orders, legislative documents and DD Forms 1351). 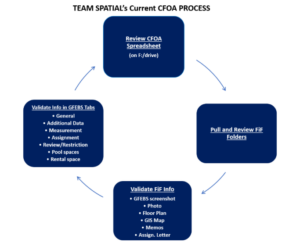 GFEBS Record Examination and Data Corrections/Updates: Examine all RP records currently entered into GFEBS for accuracy and completeness. Enter all data necessary for GFEBS to be compliant and complete including updating pooled space and rental objects, unit of measure, CATCODES (including CATCODE changes for SCIF structures), and update/correct data in GFEBS so it aligns with the down trace systems square footage for accurate energy usage reporting. When anomalies are found, the required/accepted Memorandum(s), per OACSIM’s Audit Readiness Handbook v3, are drafted and staffed for signatures. Only after signatures are complete will changes be made within GFEBS. Create new records for real property assets: Enter information obtained from signed DD Forms 1354.